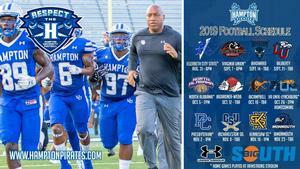 Hampton, Va. (Jan. 25, 2019) - Hampton University Director of Athletics Eugene Marshall, Jr. and Head Football Coach Robert Prunty announced the 2019 football schedule this afternoon. Hampton will have a 12-game schedule, with six home dates and four matchups with Historically Black Colleges and Universities (HBCU) along with a seven-game Big South Conference slate. “With this schedule that was created with the help of many people across campus, we were able to maintain our history with matchups against the CIAA and MEAC schools which is what we have wanted since the beginning,” said Marshall. Hampton finished its first season under head coach Robert Prunty with a 7-3 record and ended with a six-game winning streak. This will be the first meeting with the Vikings since 1995 when Hampton won 36-13 at home. Elizabeth City State finished 1-7 in 2018 under head coach first year head coach Anthony Jones. Hampton leads the all-time series 14-7-3. This matchup will bring a former Hampton University head coach and soon to be College Football Hall of Fame inductee back to Hampton as Joe Taylor is the Director of Athletics at Virginia Union. The Panthers were 8-2 last year under first year head coach Dr. Alvin Parker. Virginia Union leads the all-time series 41-38-3. Sept. 14 – at Howard – TBA - Washington, D.C. The Battle of the Real HU resumes after a year break as the Pirates venture to Greene Stadium on the campus of Howard University for the renewal of the rivalry. Howard finished 7-3 in 2018 and will be lead by Ron Pringle in the 2019 campaign. Hampton has won the last three meetings and holds a 50-42-1 all-time series lead. Sept. 21 – at Liberty – TBA - Lynchburg, Va. The Pirates head to the Hill City to take on the Flames as they step into FBS level action. Liberty was 6-6 in 2018 and will be under the leadership of new head coach Hugh Freeze to start the 2019 campaign. Hampton is trailing the all-time series 4-2 after having won the last meeting 21-0 at Hampton in the 1998 season. The first-ever Big South Conference game for the Pirates will pit them against fellow newcomer North Alabama. These teams are familiar with each other having played in the 1992 and 1993 seasons with UNA winning both. North Alabama finished 7-3 last year under Chris Willis who will enter his third season at the helm in 2019. Oct. 12 – at Gardner-Webb – TBA - Boiling Springs, N.C. The first Big South road game brings Hampton to Boiling Springs, N.C. to face the Runnin Bulldogs of Gardner-Webb. Under head coach Carroll McCray, Gardner-Webb finished 3-8 last year. Hampton leads the all-time series 2-1 having won the last two meetings including a 52-21 win at Gardner-Webb in the last contest held in 2005. Oct. 19 – at Campbell – TBA - Buies Creek, N.C.
A second weekend in the Tar Heel State brings Hampton to Buies Creek to take on the Camels of Campbell University. This will be the first-ever meeting between the schools as Campbell was 6-5 last year under now seventh-year head coach Mike Minter. Hampton steps out of Big South play for Homecoming as the Virginia University of Lynchburg Dragons return to Armstrong Stadium. Second-year head coach Bobby Rome guided the Dragons to a 3-7 record The and lost 51-28 to Hampton last year. The Blue Hose visit Hampton in a return of a 2018 thriller in Clinton, S.C. where Hampton pulled out a 24-23 win by stopping a two-point conversion in the final minute in the first ever meeting between the schools. Presbyterian is under the leadership of 16-year head coach Tommy Spangler and they finished 2-8 overall and 0-5 in conference play. Nov. 9 – at Charleston Southern – TBA - Charleston, S.C. The first of two road trips to close the season brings the Pirates south to Charleston, S.C. to take on the Buccaneers. Charleston Southern defeated Hampton last year 48-14 at home in the first-ever meeting between the teams. The Bucs will be under the leadership of new head coach Autry Denson. The defending Big South Conference champions come to Hampton for a first-ever matchup fresh off advancing to the FCS Quarterfinals. The Owls finished 2018 11-2 under the tutelage of now fifth-year head coach Brian Bohannon. Nov. 23 – at Monmouth – TBA - West Long Branch, N.J.
Hampton closes the season by heading to Monmouth for the second straight season. The Hawks, under the leadership of 27-year head coach Kevin Callahan, finished 8-3 overall and 4-1 in conference play. Monmouth defeated Hampton 56-28 last year and lead the all-time series 2-0.